Rajasthan has a unique culture and a thousand-year-old heritage. 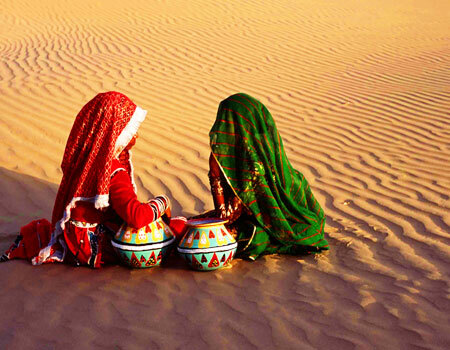 An extraordinary assortment of varied topography, lifestyle and history make the culture of Rajasthan even richer. Every aspect and each facet of the state displays the rich cultural heritage of Rajasthan. The brilliant attire of the local people, the splendid forts and havelis, vibrant fairs and festivals, colourful bazaars, all symbolize the diverse culture of Rajasthan. The multitude of festivals and fairs celebrated here add a touch of liveliness to the otherwise dull lives of the inhabitants. The festivities make the rustic desert landscape colourful. Each occasion is celebrated with great fun in Rajasthan; Rajasthan celebrates every birth, harvest, religious as well as cultural festival at a grand scale and with great pomp and show. Rajasthan comes alive with these celebrations. Festivals here are a means to enjoy even the smallest pleasures life offers. Hindi is the language that is commonly spoken in Rajasthan. It is also the official language of the state. The local people speak in Rajasthani and Marwari as well. Rajasthanis are very religious and strictly follow all the traditions. Most of the people in Rajasthan follow Hinduism followed by Jainism, Islam, Sikhism and Christianity. The architectural wonders are additions to the rich culture of the state. The forts and palaces echo the tales of the royal history of Rajasthan. They speak volumes about the erstwhile romance and gallantry. These palatial structures are living testimonials to the rich cultural heritage of the state. The series of shops that dominate the vibrant bazaars of Rajasthan are overflowing with an array of beautiful handicrafts and goods. The Rajasthani hand embroidery is very famous all over the world and leading fashion designers come here to get their garments embroidered. Designs on textiles like Zari, Tie and Dye, Sanganer and hand block printed are quite popular. Jewelry in gold and silver, brass and metal work and blue pottery are simply a steal. The regal cultural heritage of Rajasthan appeals to the senses of one and all. The culture in Rajasthan is in sync with the rest of the state. Culture at its best can be seen in Rajasthan.